A few years ago a California zoo intern, Diana Hanson, was killed by a lion. The five –hundred- fifty- pound king of the beast took one swipe and broke the young woman’s neck. She died instantly. She loved working with animals and had much experience with them. However, on that morning, while talking on the phone, she let down her guard. The lion escaped from his feeding cage. One moment of carelessness brought disaster. 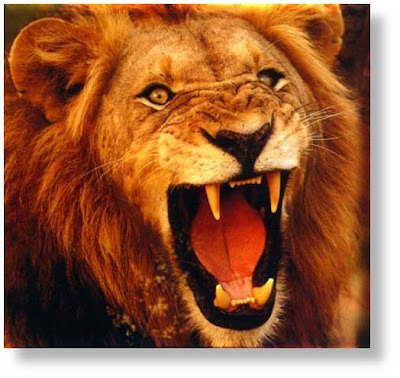 Peter calls Satan our enemy and likens him to a roaring lion looking for someone to devour. We may think we are immune to his devious nature, but he is always on the prowl. Like the lion at the zoo, he finds us in our weak moments and pounces. In jest we sometimes say, “The Devil made me do it.” God gave us a free will and Satan can’t make us do anything. He can and does tempt us many times and in many ways. He is the lion waiting around the corner with an evil sneer on his face. He knows our weaknesses. Like the mighty lion on the prowl he attacks in our weak moments. You may be convicted about the harm in gossiping. Then one day while having coffee with a friend a juicy tidbit pops out of your mouth. Ever use this excuse, “We really need to pray for -----.”? Our scripture for today tells us to be self-controlled. How do we manage that? Paul reminded the young preacher, Timothy, The Spirit God gave us does not make us timid, but gives us power, love and self-discipline (2 Timothy 1:7). Ammunition for today: No temptation has taken you except what is common to mankind, and God is faithful; he will not let you be tempted beyond what you can bear. But when you are tempted, he will also provide a way out so that you can endure it (1 Corinthians 10:13). Dear Father, Protect us from the prowling lion. Help us rely on the Holy Spirit for power, love and self-discipline to use against our enemy, Satan.